Which structures in this vendor library are already contained in my own database? What proportion of structures in one database are more than 85% similar to any structures in another database? 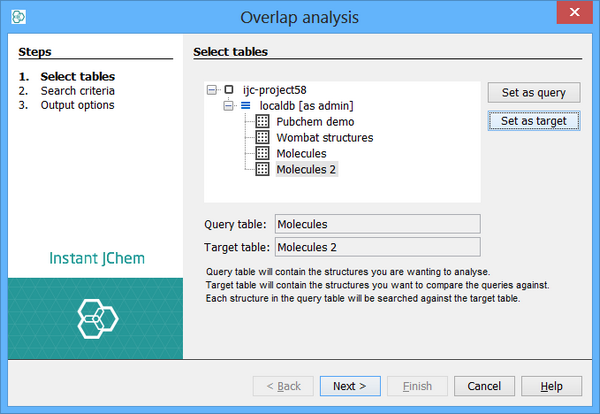 Create a JChem entity (database table) for each of the sets of structures you wish to analyse. These do not have to be in the same database, but typically are. Here we will assume that you have created two JChem tables, one with the query structures and one with the target structures. 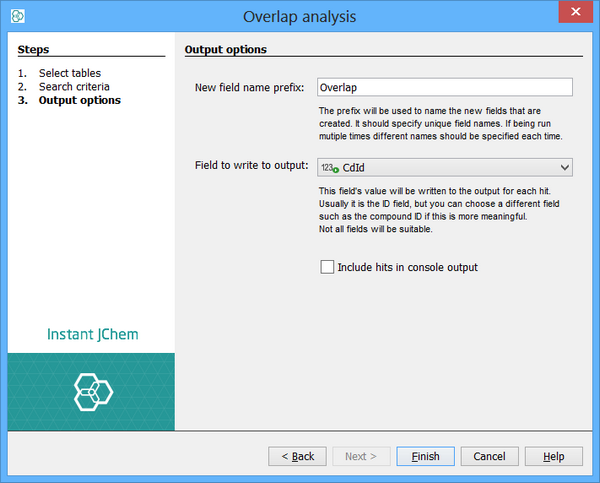 Choose Chemistry -> Overlap Analysis. The Overlap Analysis wizard opens. Select the query and target tables (these can be the same tables if you want to do a self-comparison), by selecting them from the mini Project Explorer and clicking on the appropriate 'Set as...' button. Specify the maximum number of hits to report for each query structure (this is most useful when running a similarity search). Specify the type of search (duplicate, full, similarity). Specify search options. These are the same as the structure search options when running a query . 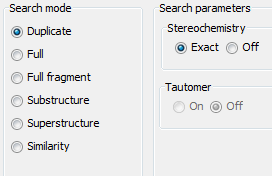 If the target entity is created as type "Query structures" then the tautomer search option will not be available during "duplicate" overlap analysis (both option will be grey out). 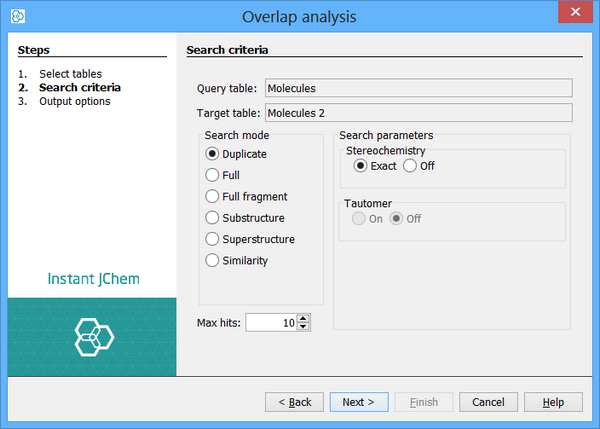 If the target entity is created as type "Molecules" without "tautomer duplicate" option ticked then the tautomer search option will not be available during "duplicate" overlap analysis (both option will be grey out). Specify a name to use as a prefix for the resulting Fields. When running multiple sets of overlap analysis on the same query table, each one must be provided with a unique name to use as the field prefix. Specify the field in the target table whose values are to be used in the output. Typically this is the ID field which will be selected by default, but if, for instance, your target table also contains a separate compound ID then you might want to specify this field. Not all fields will be appropriate so choose carefully. Specify whether to write the hits to the console window. Typically this is useful, but it there are a very large number of query structures that match then the output can get too long and you can run into OutOfMemoryErrors. Click 'Finish' to start the analysis. For large numbers of structures this can take some time to complete. These fields can be sorted and queried like any normal field. This can be very helpful when performing an analysis of the results.